This is my last post from Thailand. I will check in again during my layover in Hong Kong. Thank you everyone for being a part of this. Enjoy. When I first arrived the voices and faces all looked the same. The language alien. But as time went on I had began getting to know the fighters and the trainers on a personal level. I am not only leaving behind a gym that I had been training at but also the new friends I have made. From my pad holder to the pancake man and from the fruit lady to the man at the pad thai stand. I am leaving it all behind. I originally posted my first blog asking what I would be training. Was it my body? My mind? All those things I had originally listed. It was all there, and more. I had been training myself not only to learn how to kick faster or stronger, but I was learning how to grow as a person and bend without breaking, like bamboo in strong winds. I wasn't only training to throw vicious elbows, but was also training to think quick and respond in the heat of the moment. There were times when I had to dig deep. I wasn't only visiting a new land here in Thailand, but I was also visiting a new land within myself. I've seen the Temples of Thailand, and in return seen the Temples within me. It has been a journey I will never forget. Some people back home told me before I left that the flight there wouldn't be so bad because I have it all to look forward to. And that the flight home would be the killer because there would be no reward. But I find this untrue. I realize after being here that I have it all back home. I have everything to look forward to and everything that I could ever need to live my life. I feel somewhat of a simpler man nowadays. I ate at places that I wouldn't dare to eat at if I had seen them back home. I've ate things that I wouldn't even think to touch as well. I became use to the ants in the white rice and on the plates and cups. I remember when I first arrived I would pick the ants off the spoon before scooping into the rice. The other farang who have been there a while would say "stop being a lady boy". After 2 weeks I was saying the same to the new guys coming in. There were also times when I had been training so hard for days on end that I would often forget if it was the morning or afternoon session. They would sometimes feel like they merged right into each other with no rest. I've worked through pulled back muscles, ran for countless miles with swollen feet, destroyed the tendons in my knuckles, and did thousands of sit-ups. Some people go to an island or a cruise for there vacation, but I chose this. Anything but. I've come to realize what the human body is capable of doing and how it adjusts so quickly. I feel like a fine-tuned machine. When I first arrived the Thai's weren't impressed by my presence. We would walk right by each other without saying a word. But after a while we had grown like family. We would teach each other bad words in our respective languages during situps. Often times I would be out at the store far away from Talingchan and I would run into a couple fighters. When we seen each other we would start going crazy and laughing and share a taxi back to the gym. We couldn't communicate through language, but I learned a smile breaks all barriers. There wasn't much to do when not training so we would hang out at the seven(7-11). We would try to talk with the girls that worked there in our best Thai and thier best English. I had bought a book on Thai phrases and we would eat pad Thai outside and laugh back and forth for hours. I even went out to the movies once with Ning. Phil had once said, if shes a good Thai girl, she'll make you wait 2 months just for a kiss. Turned out she was a good girl. She requested to come with me to the airport and see me off. I feel like I'm leaving home....again. I've had close to 650 views at my blogs over the last few weeks. I could have never imagined it would be like this, the feedback was great. I learned I have a decent talent for writting. Maybe something I will pursue in the future. I often thought over the last couple of days what I would write for my last blog, my last hu-rah, but I don't like to force or premeditate anything. So I just sit here now, typing away whatever comes to mind. I'm almost at a loss for words. Looking back it has came and gone so quick. And this is all it, right here, right now. Everything that I had learned about Muay Thai, Life, and Myself. Life is about the journey and not the destination. Thailand was not my destination, neither will be New York. They are all part of the journey, this journey called life. Everything ties together in some way, shape, or form. It's funny, because just today I had wondered why it is I love this culture so much. What was it that drew me to this sport and wanting to learn more of the people and the land. And it had hit me. I remember when I was about 6 or 7 my grandfather would take me to the asain store all the time. And everything there seemed to fascinate me. The artwork, the dragons, the whole culture. So I wondered if it was that, mixed with the fact that both my grandfather and father were boxers, that had meshed and molded my love for this here. "John Wolcott 11/19/07 Dream Lived"
People who do any sport are, in a way, the face of that sport. Look at this year's ambassadors to pro-baseball, track and American football. Baseball has been plagued with accusations and admissions of steroid abuse. Marion Jones had her Olympic medals stripped from her, and Michael Vic brought new respect for pro-football players by operating his own dog-fighting ring. High profile incidents affect public opinion of a sport, but I think that every-day occurrences at the most amateur level can affect perception of the culture of sport. Lost yet? Well, it makes me think of Muay Thai and other fighting arts. Over the years, I have come into contact mostly with athletes from boxing, Tae Kwon Do, and MMA backgrounds. Because I don't have much experience outside of my encounters at the gym, I have formed certain perceptions about the cultures of these sports. Many boxers don't like to kick. The ones I have spoken to outside the gym have no respect for kicking. I believe foot fairy is a commonly used term amongst those boxing aficionados I have met. Tae Kwon Do and other martial arts are by far the most open minded people I have met at the gym. They are respectful, easy to train, and well-mannered. Sorry to everyone else, including Muay Thai, but the ambassadors to the martial arts had the most esteem in my book, until yesterday. One bad ambassador from Wing-Chun was so obnoxious to me yesterday that I can't help but wonder if the philosophy of the sport is like that. This guy was so condescending and rude that I was left thinking that the school of Wing-Chun is pretty stuck-up. Is it right for me to think like that? No. But do I? Yes. It's human nature, and so I began to worry about my Muay Thai ambassadors out there. I know what our major short coming is: VANITY. We like to look good. We (generally) have nice physiques, and we worry about coordinating our gear. (LOL YOU KNOW IT S TRUE ) The heart of a muay Thai fighter though, is supposed to be humble. Point being, we all need to make sure that we represent correctly. There are a lot of us who practice Muay Thai but, then again, we are a small community. We have to put our best foot forward. Especially here in USA, there is a negative perception about out sport. People think its dirty fighting. They think it's dangerous, savage and un-marketable. We couldn't even get a network to pick up The Contender Asia. We have to make sure that wherever we are, we educate people about the beauty and athleticism of Muay Thai. I just hope that no one ever posts a blog talking about some jerk-Muay Thai person who was rude and condescending . The community is watching, and we handle our own. A band of braided cloth worn around either one or both of the fighters upper arms, used to ward of danger and induce toughness. These amulets are a bit more personal to the fighter than the Mongkon. He can incorporate anything from a strand of his mothers hair to a thread of clothing from a loved one. Any such personal items placed under or within the Pra Jiad is believed to raise the confidence level of the fighter. Unlike the Mongkon, the Pra Jiads are kept by the fighter until the time of competition. They are then tied around the arms of the fighter by the teacher followed by a prayer and the Mongkon ritual. 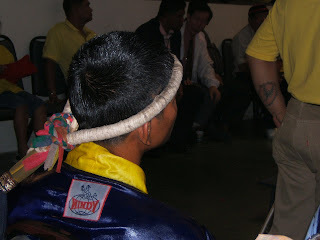 The Mongkon is a sacred amulet worn on top of the head to protect the fighter from danger and injuries. In the past, the Monkgon was worn throughout the fight. If it fell off the fighters head during combat his opponent would allow him time to place it back on. 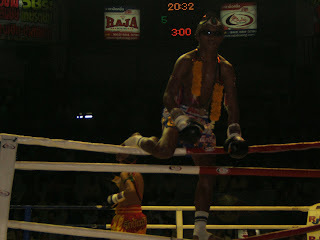 Nowadays, the Mongkon is only worn during the Ram Muay and Wai Kru. It is said that if the Mongkon touches the ground or comes close to it, it can lose its magical powers. A fighter should never touch the Mongkon. Only his trainer can place or remove it form his head. In times past, anyone wanting to learn Muay Thai would first have to be evaluated by the trainer. If he was accepted as a student, he was given a Mongkon. In Thailand, if the tail of the Mongkon is facing upward, then the fighter is from southern Thailand. If facing downward, then the fighter is from northern Thailand. If the tail of the Mongkon is facing straight back, then he is from central Thailand. Due to the invasion and total destruction of Ayutthaya in 1767 by the Burmese, no written word exists on the origins of Muay Thai. Oral traditions passed down from generation to generation and from teacher to student tell us that Muay Thai began sometime around 2,000 years ago. Mixed with various weapons of combat, Muay Thai was first practiced as a form of self defense against invading armies from neighboring countries and martial training during peaceful times. It was not until around 1925 that Muay Thai was recognized as a professional sport. During this time the introduction of boxing gloves, rules and regulations, and the building of two stadiums, Lumpini and Ratchadamnoen had taken place. Before this time participants often fought with bare fists or their hands bound with hemp threads. The fights took place on bare ground with no ring, encircled by spectators. Around this time the sport also started gaining wide spread popularity throughout many regions of the world spreading to Europe first then to the west.